With such timeless beauty, heirloom details, and a quiet poise throughout each photo, Caitlin and Sean's wedding could truly be from another era. 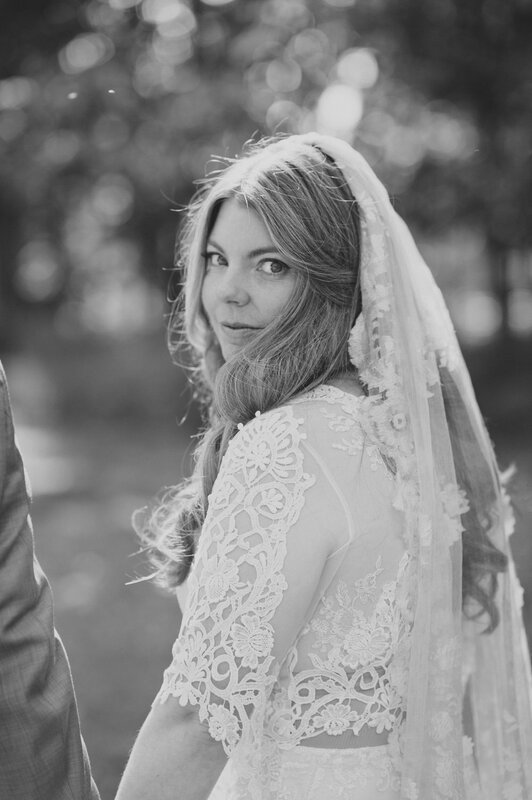 Caitlin carefully chose the Claire Pettibone Julia gown to wear on her wedding day, which was held at an historic inn in Stockton, New Jersey. With Guipure lace layered over lace embroidery and a long and delicate train, the Julia gown is reminiscent of an heirloom dress passed down through the generations - yet completely of-the-moment thanks to an illusion back and sleeves, and a lowered neckline customized just for Caitlin. Speaking of heirlooms passed down through the generations, Caitlin paired her gown with a lace veil worn by women in her family since 1831. How incredible is that? Enjoy the dreamlike photos by Christina Lilly Photography! Do you love Caitlin's Claire Pettibone gown? Experience the new Claire Pettibone collection during a very special trunk show at Little White Dress, March 6th-8th! Call 303-814-8972 or visit our website to schedule your appointment. Jenny Packham Trunk Show at Little White Dress!